The HEY! label returns to round off the year with a new release from the chief himself together with Rauwkost. 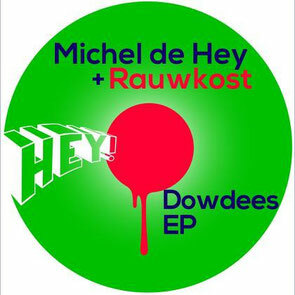 This hook up between DJ/producer, Michel de Hey, and Amsterdam’s Rauwkost, is a productive collaboration. Their recent ‘Julienzz’ track on John Digweed’s Bedrock label stayed in the Beatport charts for weeks and this new HEY! release may have the same destiny. The inspiration for both ‘Dowdees’ and ‘Incense’ came from several beach parties where Michel played during the summer. Title track, ‘Dowdees’, swings with a deeply groovy house attitude that should entice people onto the dancefloors. NT89 is one of Michel’s favourite producers at the moment so when he admitted that he used to be raving to Michel’s DJ sets for many years the remix deal was closed within a second. His energetic, smoothly melodic remix could be a hit with all new UK house lovers. ‘Incense’ finishes off the EP with a flourish. It's out today, check it out below.